All the failures that have underlined their recent problems under Lopetegui were on show here, poor finishing, dreadful defending and key players performing well below par, let alone at their best. There was also some bad luck, as Luka Modric hit the post at 2-1, while Suarez’s second was a penalty, awarded only after consultation with the Video Assistant Referee. Philippe Coutinho had scored the first and Arturo Vidal finished a late flurry but in between the game belonged to Suarez, who terrorised Madrid and made light of Lionel Messi’s injury-enforced absence. “We have to be proud of having the best player in the world,” Suarez said. “But we have shown that we are a great team and that we have a great coach too.” For Lopetegui, it is now one win in six games, as Madrid stay ninth, seven points behind Barcelona, who return to the top of the table. “What we have shown today is what we have shown all season,” Casemiro said. “We have to run more, stand up more, fight more.” This defeat was reminiscent of the 4-0 thrashing that spelt the end for Rafael Benitez in 2016. Benitez survived two more months, Lopetegui may not last the week. 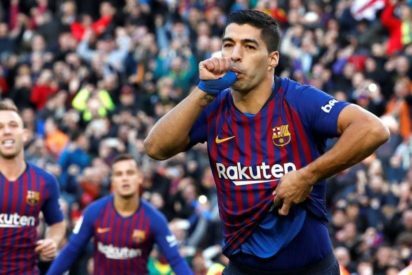 Much was made of this being the first Clasico without either Messi or Cristiano Ronaldo in 11 years but Suarez’s masterclass will mean it lives long in the memory, particularly for him, coming five days after the birth of his third child. “It makes me very happy,” Suarez said. Jordi Alba created the opener as he zoomed past both Gareth Bale and Nacho, before finding Coutinho by the penalty spot. It was the move’s 30th pass, the most for a goal in a La Liga Clasico in 13 seasons. – Lopetegui motionless – On the touchline, Lopetegui stood motionless. Raphael Varane clapped but his team-mates looked shell-shocked. Sergio Ramos thrashed a pass across his own box to Nacho, who hacked it to the feet of Arthur, his shot parried away by Thibaut Courtois. Still, Barca needed the help of VAR for the second. Suarez was too quick at the near post and Varane bundled him over. It was a clear penalty, which Suarez converted for his seventh goal in 11 games against these opponents. His eighth and ninth were still to come. Gerard Pique should have headed in while a promising Madrid free-kick somehow ended with another Barca sprawl on the counter-attack. The visitors were fortunate to be only two down at half-time. Varane was taken off, with a muscle problem the club said, for Lucas Vazquez, and he was key to Madrid’s goal, his disguised pass allowing Isco to pick out Marcelo, who finished for his third in three games. Suddenly, it was Barca making the mistakes. Ramos headed over, Modric hit the inside of the post and Isco’s finish was blocked after Rafinha ran into trouble. Madrid were still nervy at the back, where Suarez acrobatically volleyed onto the post and then landed the knock-out blow. Sergi Roberto chipped a cross into the box but the ball had neither the pace nor the angle to be headed in easily. Suarez, however, generated both himself to leave Courtois stranded. If that was a masterclass in adaptation, his third was a demonstration of finesse. Ramos was pushed off the ball by Sergi Roberto, who freed Suarez. Suarez feathered the ball over Courtois for his hat-trick. Madrid were finished but the humiliation was not complete as Ousmane Dembele crossed for Vidal to head home a fifth. Suarez could even have had a fourth in injury-time but Courtois saved. Five was more than enough.